While books and websites can be entertaining and educational, there is no substitute for the inspiration that comes from a real flesh and blood training partner. Anyone who has had a great personal trainer or worked out with athletes can tell you that there is no better motivation in the world. 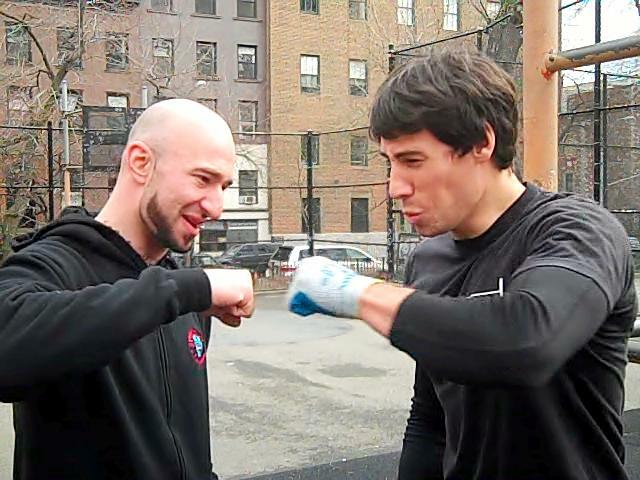 My number one training partner is my brother Danny; he and I have been working out together since we were teenagers. We’ve done scaffold pull-ups, had a dead hang pull-up contest and even built a backyard pull-up bar. We sure love pull-ups! Though it’s great to train with someone so similar to myself, working out with different trainers and training partners has led me to expand my horizons. From my caveman workout with Lenny Lefebvre, to my MMA workout with Matt Ruskin, I’ve been lucky to have lots of great training partners over the years. Another of my favorite workout partners is my friend Rick Seedman from the Bar-barians. 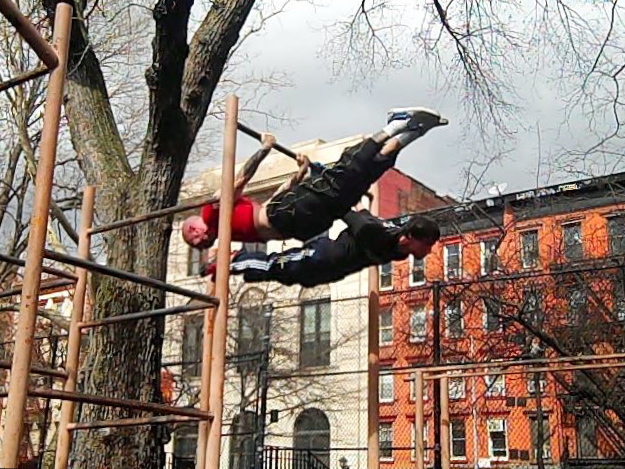 Rick and I spend a lot of time training together at Tompkins Square Park. We’re constantly pushing each other to test our limits. While it’s great to get a session in with friends when possible, don’t get dependent on them. It’s not going to be feasible to train with a partner every workout; remember that you need to find intrinsic motivation as well. Great stuff, as always, Al! Keep it up! Absolutely! Running buddies are the best! Working out with others always makes you step your game up! 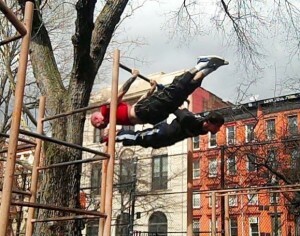 I do way more reps when im training with or around others, then i do in the park by myself. Good vid, Al. Thanks, Redd! By the way, looking forward to the 2011 5B’s Pull-up Jam this summer! Very true Redd and great video guys. I often do a “follow the leader workout” where a buddy and I will alternate picking different exercises to do. That way our bodies are always kept guessing. Hey Ethan – glad you enjoyed the video! Follow the leader workouts are great – seeing your buddy do it first can give you the “if he can do it, I can do it!” mentality. Man, I ALWAYS work out alone, but I know the value of having someone to push you. I’m really curious to see how much better I could be with a training partner. Good stuff Al! Thanks, James – there’s gotta be someone in Seoul besides you who trains this way, right? If not, you could try having an imaginary training buddy. Picture me telling you, “We’re Working Out!” if you ever find yourself thinking about wussing out during a set of muscle-ups.